According to the Minister, the Technical Universities must see themselves as tertiary technical and vocational institutions that prepare people for specific trades, crafts and technology. Other professionals that technical universities churn out are in the fields such as Engineering, Accountancy, Nursing, Medicine, Architecture, Pharmacy, Law, Police and many more. The Minister was of the view that a technical university prepares young people to be future leaders. He said ‘Technical Universities give their products the capacity to do something with their brains and hands’. 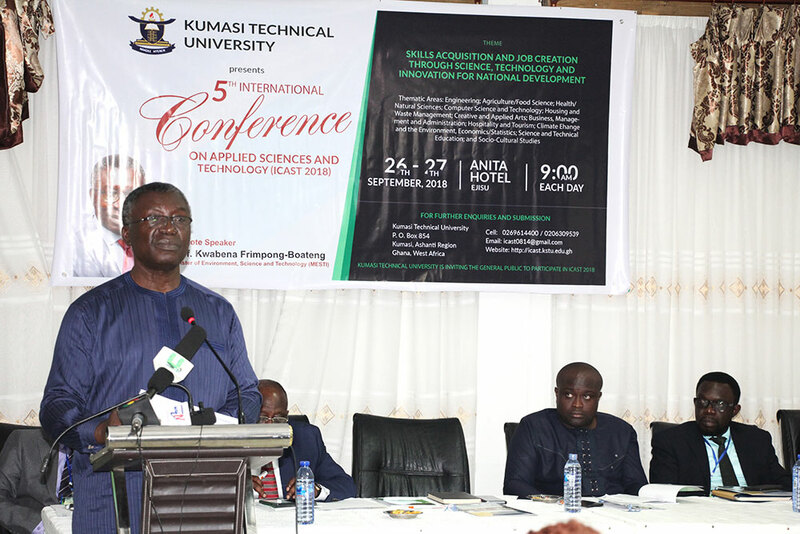 In view of this, Prof. Frimpong-Boateng further intimated that government seeks to increase Science, Technology, Engineering and Mathematics (STEM) content, both knowledge and skills as well as pedagogical skills in STEM related to formal, informal and skills development training across the country. He said as a way of promoting STEM, the government was drawing up a composite index that measures the country’s capacity to use STEM to carry out scientific research and foster technological progress. The Minister again mentioned that the government was offering pointers to policy measures that might strengthen specific national systems of innovation. He said indices would incorporate Science Enrolment, Number of Engineers and other Scientists, Patents issued, Articles published in science and technology journal articles, and research organisations; Research and Development (R&D); Spending as proportion of GDP; Contribution of R&D to GDP; New Firms & Companies that have been created through R&D; as well as New products that have arisen out of R&D. On his part, the Acting Vice Chancellor (V.C) Prof. Mike A. Acheampong also stated that the organisers of the programme could not have chosen a better theme given the fact that unemployment has been a challenge globally. He said Ghana has had its own portion of this global phenomenon over the years and therefore, unemployment has become one of the numerous agenda being tackled seriously by the current New Patriotic Party (NPP) government in particular. He further stated that, the reality is that skills acquisition has always been the prerequisite for sustainable employment which facilitates national development. The Acting V.C intimated that as researchers and research institutions, there was the need to focus on conducting applied and demand-driven research. He stated that ‘our mission should be to deliver practice-oriented teaching and learning, applied research, with emphasis on technology development, adaptation and transfer’. In other words, ‘we must endeavor to bring the world of work into the classroom and place practical knowledge and research results at the disposal of industry’, he stated. The Ashanti Regional Minister Hon Simon Osei Mensah in his speech said, government has carefully drawn out programme for skills development to prepare the youth of the country to take up the mantle of leadership of this country. He said the government among other things, was determined to further strengthen collaboration between industry, universities, and research centers to promote the commercialisation of scientific research outputs. He stated that ‘there is also a conscious effort to stimulate the demand for science and technology from the private sector as well as collaborating with the private sector and the international financial institutions, to establish a flagship system of Ghana Centers of Excellence (GCEs) across the country that networks all Higher Education Institutes (HEIs), including all other research organisations such as council for Scientific and Industrial Research (CSIRs) and Cocoa Research Institute of Ghana (CRIG)’. The Regional Minister further alluded to the government’s support to the national policy of achieving 60:40 student ratios for the sciences as compared to the Humanities by expanding STEM scholarship schemes and the government’s determination to establish apprenticeship and skills development center to train skilled labour-force for specific industrial sectors. Finally, the Ashanti Regional Minister emphasised that the President, His Excellency Nana Addo Dankwa Akufo-Addo has initiated bold policies to transform the economic foundation of the country and create more jobs as well as improve on the human resource base of the country. He said these include free Senior High School, One District One Factory (1D1F), One District One Warehouse (1D1W), Planting for Food and Jobs and many others.